Its payday again. And the urge to buy those things you are really longing to have is fast rising. As a toy hobbyist it is really hard to ignore Toy Sale. Like now, even though extra bux are slashed in my salary (because of lates and undertimes), I'm still decided to get that collectible by hook or by crook hehehe. But I think girls are still unmatched in terms of Shopaholic tendencies. Like this girl I knew. Her name is Rebecca Bloomwood (Isla Fisher). A journalist on a small time publishing house, raised in England and all she really dreams is to be part of a Famous Fashion Magazine where she think she can share her expertise in fashion and off course to earn much more to pay for her ever growing debt. Deprived by thrifty parents during her early years, Becky became so obssesed of luxurious fashion items that transforms her credit cards to one way trip ticket to jail. 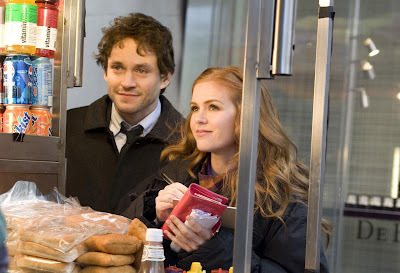 As she is trying to penetrate the Fashion scene, she crossed path with a well reserved and strict Finance Editor, Luke Brandon (Hugh Dancy). Now Becky is juggling Love, Debt, Friendship, Family and her Dreams all on the same time. Will she overcome her Shopping addiction? Will she ever fix her Life? I guess it is all up to her to decide. Confessions of a Shopaholic is a movie adaptaion of a book with the same title written by Sophie Kinsella. Didn't really read the book but I love watching chick flicks specially that Isla Fisher is in there. Though I know she is already engaged and already had kids with fiancee Sacha Baron Cohen, I still admire her beauty, perkiness and talent. Perfect for the character of Becky bloomwood. But I must admit, many said that she doesn't sound English in the movie. But I forgive her for that. Hugh Dancy as Luke Brandon is also perfect. He already established a good chemistry with Isla and he perfectly portrayed his role as a strict finance Editor. Its a good idea of casting Joan Cusack and John Goodman as Becky's parents for we all know how good actor are they but it is just sad that the movie didn't give enough focus to their characters. I think they deserve the spotlight. The story is an adaptation of the first and 2nd Shopaholic book (Confessions and Conquers Manhattan respectively), according to book readers, there are several elements of the book that are deleted, off course solely for the reason to make the book filmable. The movie is light, funny and enjoyable. I watched the movie with Girl friends and we all have a good laughs. Congratulations to film maker P.J. Hogan for doing a good job. 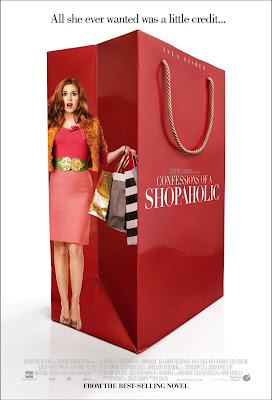 Confessions of a Shopaholic is brought to us by Touchstone Pictures and still showing to some local cinemas. Catch it while you can. Btw. thanks to NuffNang Phils. for the tickets.